Large thermal vac chamber with automated temperature control and simulation. Abbess TVAC Thermal Vacuum Systems offer an integrated system solution for chamber environments where both vacuum pressure and temperature are crucial to a customer’s process or test. Test chambers can involve thermal plates and shrouds in a variety of materials and finishes which are isolated from the chamber wall. Cartridge heaters and/or engaged piping can circulate LN2, direct expansion refrigerant gases, or specified thermal transfer fluid from an Abbess Snow River system. Alternatively, Abbess Bakeout or ‘Thermal Box’ chambers employ similar technology to actively thermal manage the chamber itself, which is insulated from the lab or factory environment with an insulation and sheathing enclosure. Abbess engineers will work with you to customize our TVAC systems to meet your needs. Customization can be achieved via the introduction of a wide range of feedthru components for interaction with the Article Under Test, different control configurations, as well test data logging and process profile automation. Bakeout, Thermal, and Vacuum Assisted Curing, Severe Environment Test: Abbess can match the Integrated TVAC System to each customer’s multi-faceted need! Thermal componets can be integrated into any system in the temperature range of (cold)-320F/-196C to (Hot)+300F/150C with vacuum from atmosphere to 10-9 torr. Looking for higher vacuum than 10^-6 torr? See our Space Simulation Systems. If you are looking to heatseal your products, please see our Sealers. 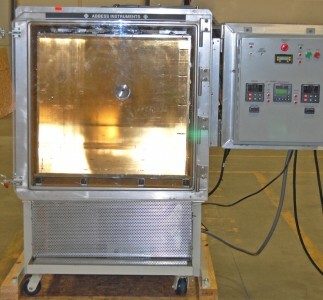 Our thermal test chambers allow you to simulate what you need. In addition, heated chambers can provide vacuum outgassing.